Originally meant just for storing scrolls, with time libraries assumed the role of vaults protecting invaluable volumes. Nowadays, they also aspire to be public-oriented culture-promoting centres. Culture.pl presents the 10 most ingenious and boldest examples of library design in contemporary Poland. The proverb ‘never judge a book by its cover’ perfectly suits the railway station in Rumia. This modernized yet unassuming building erected in 1958 houses a real marvel – an innovative cultural centre. This elegant and cosy space is divided into zones and includes a library, a suite of photographic, artistic, and sculpture studios, a children’s corner (full of books for children and educational toys), computer work stations on the mezzanine, conference halls, and NGO offices. Anyone who feels like setting off for a journey through different periods of literature may enter the former waiting room transformed into a reading room, choose a book, and sink into one of the couches arranged to resemble train compartments. This is not the only railway connotation: black and red elements of the interior design make associations with an old locomotive, the book racks are stylized to resemble railway tracks, and the passing of time is measured by a railway clock. This refurbished building, which was opened in September 2014, is still a functioning railway station, however, the area dedicated to the passengers of suburban trains has shrunk to 20 percent of the building’s area. The enchanting design by Jan Sikora (Sikora Interiors) attracts not only local inhabitants (the number of readers has risen by 50 percent), but also architecture lovers from all around the world. The jury of the prestigious American Library Interior Design Awards dubbed ‘Culture’ Station the most beautiful library of the world in the Single Space Design category. This world-class premises located in a small town is a must-see for all connoisseurs of books and creative interior arrangements. Jorge Luis Borges described the universe as a phantasmagorical library composed of an infinite number of hexagonal galleries, an infinite number of floors and spiral stairways containing all the books of the world. A little bit of that unrealistic and fantastic vision has actually been realised by the HS99 architectural studio, designers of the libraries of Katowice’s two universities – the University of Silesia and the University of Economics. It is not easy to assess the number of floors or the number of bibliographic items displayed on its nearly 60 kilometres of shelves. The interior, arranged with geometrical precision, gives a feeling of harmony and calm. The windows help create an exceptional atmosphere: daylight penetrates through 4,000 glass apertures, and after dusk, artificial lighting draws patterns on the building’s façade. The building, composed of two combined cubes of different height, ideally harmonises with the urban landscape of Katowice. The intense colour of the external sandstone walls (the inhabitants call the building ‘the redhead’) corresponds with the neighbouring industrial red-brick buildings and Silesian multi-family houses (familoks). The winner of many architectural awards, it was built in 2012. Warsaw University Library, 1994-1999, design: Marek Budzyński, Zbigniew Badowski, photo: Marek Budzyński Architekt Sp. z o.o. ‘Hinc omnia’ (Latin for ‘Hence all’), reads the inscription on a huge, open book hanging over the entry to the university’s athenaeum. This book is guarded by the statues of four wise men mounted on columns: Kazimierz Twardowski, Jan Łukasiewicz, Alfred Tarski, and Stanisław Leśniewski. Inside the building, before we actually enter the library’s gate, we have to walk along a little paved lane – a passage covered with a glass roof – which connects the leisure and entertainment centre of the building with the library. This crescent-shaped part of the building houses commercial institutions; its façade is adorned with 8 boards which feature texts in various languages, mathematical notation, and a fragment of music notation (Etude in B minor by Karol Szymanowski. The design by Marek Budzyński and Zbigniew Badowski was intended to give visitors the impression that they have entered a temple from a market place, to overwhelm them with a huge open space, and to mingle tradition with modernity (the card catalogues stand next to computer work stations). Three years after the library was opened to the public in 1999, a garden was constructed on its roof. Designed by Irena Bajerska, it is one of the biggest and the most beautiful roof gardens in Europe. The total surface area of the garden exceeds 1 hectare, and the roof part of the garden is connected with the ground section by a cascading stream. On the roof one can walk through various colour zones: cochineal, golden, silver, and green (named after the colours of blossoms), and little bridges and a viewing terrace which offer a panorama of Warsaw, or one can peek through the glass roof at what is going on inside the building. On the 200th anniversary of the library and the university, Amazon presented the academic institution with 200 Kindle e-readers which can be borrowed by students. In this way BUW (Warsaw University Library) has become the biggest and the only university Kindle-lending library in Europe. The list of the most famous university libraries in Poland would not be not complete without the popular Jagiellonka. The library of the oldest Polish university has changed its location a few times to finally find its place on Mickiewicza Avenue, which is the part of Trzech Wieszczów Avenue in Kraków, where it was installed before WWII. A massive, glorious T-shaped building was constructed based on a design by Wacław Krzyżanowski. The main reading room is surrounded by galleries, the staircase is of the kind seen in palaces, and light and luminous interiors harmonise with the façade which was to give the impression of rows of books sitting on shelves. After WWII this modernist building was extended twice: in the period 1961-63 the back part of the library was extended according to a design by Jerzy Wierzbicki, and in the period 1995-2001 a wing was added with an entrance from Oleandry Street, according to a concept elaborated by Romuald Loegler. 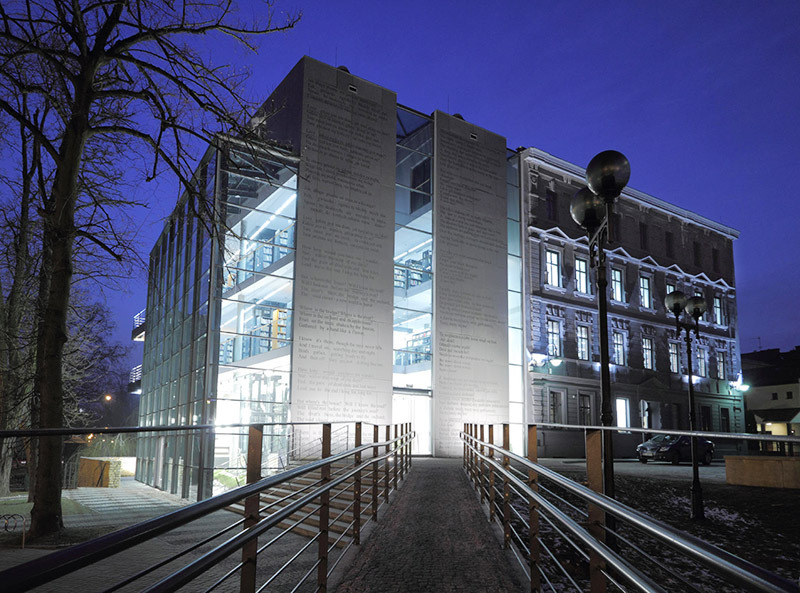 The Jagiellonian Library is deemed the national athenaeum. It has been collecting bibliographic items since the 14th century, focusing on humanities publications. The library’s staff collects and archives printed materials published in Poland and abroad. The enormously vast collection of manuscripts, incunabula, books, and other printed materials exceeds 7.5 million items. Poland’s most precious antiquities are stored here, including the 15th-century record Bogurodzica, the Copernicus manuscripts on De Revolutionibus…, Chopin’s manuscript of Scherzo in E-major, and even the Liber Viginti Artium – The Book of Twenty Arts, which was once associated with the legendary Faustian sorcerer Twardowski (a stain on the parchment was deemed to have been the imprint of the Devil’s claw). It was surely such a place that Umberto Eco had in mind when he talked about a library ‘which becomes an adventure’, and about ‘discovering books whose existence we never suspected’. The history of the institution dates back to 1829, when Count Edward Raczyński opened a regional centre for Polish culture promotion on Polish terrain under the Prussian occupation. A classical palace, the design of which is deemed to be the work of French architects Charles Percier and Pierre-Francois Fontain and inspired by the Paris Louvre, was erected with the front facing Independence Square in Poznań. The books collected in the first public library in Poland originated from the private collection of its founder. Today, the library stores the archives of Józef Ignacy Kraszewski, Kazimiera Iłłakowiczówna, and Henryk Sienkiewicz. The decision was made to return all the bibliographic items scattered in many branches of the library around Poznań to the main building in the city centre. The Warsaw architectural design studio JEMS Architekci was faced with a tough challenge. They had to design the library extension so that the building wouldn’t lose its historical context. The architects had a marvellous idea: they designed a seven-storey wing at the back of the historical building, and connected both of them with a glass-walled passage. The new façade was completed in 2013 and it is a contemporary interpretation of the colonnade which was the feature of the ancient façade of the library. The new building makes the area of the institution nearly three times bigger. Its most extraordinary solution was to locate book storage rooms on the upper levels, which do not have windows, so that sunlight does not damage invaluable volumes. The middle levels were intended for reading rooms and workshops, and the ground floor was arranged to include a tea-room, a children’s library, and an art gallery. It’s not only Poznań that makes every effort to combine the past with the present. 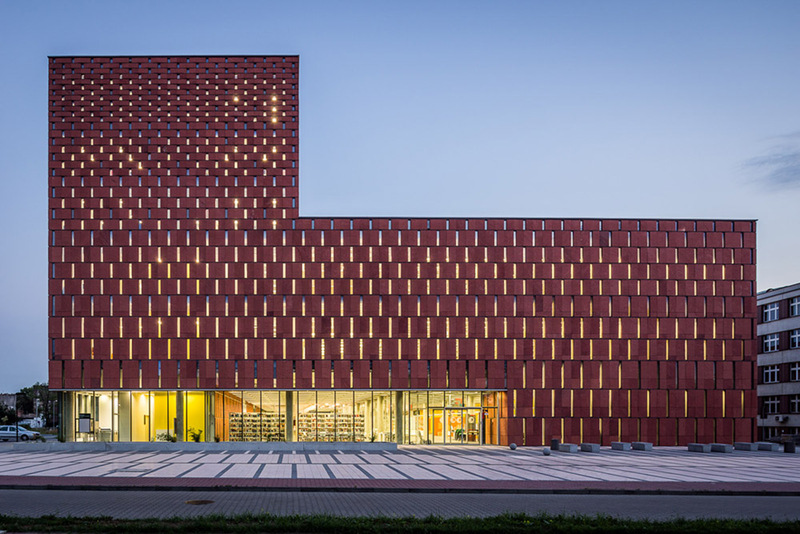 In the outskirts of the Old Town district of Opole, in the neighbourhood of a philharmonic hall, a Gothic and Baroque-style Franciscan monastery, and the Museum of Prisoners of War, is the ultramodern building of the Municipal Public Library. The simple architectural form is separated from a 19th-century tenement house by a glass crevice which opens the building onto the Planty walkway and the Młynówka canal. The interior footbridges and catwalks make it possible to move freely between the old and the new parts of the building. A spacious library building houses a librarian’s desk, a large media library, a ‘fairytale room’, a reading room with computer work stations, a photography gallery, conference hall, and a café. The eyes of passers-by are attracted by its awesome façade with engravings of Edward Stachura's lyrics. 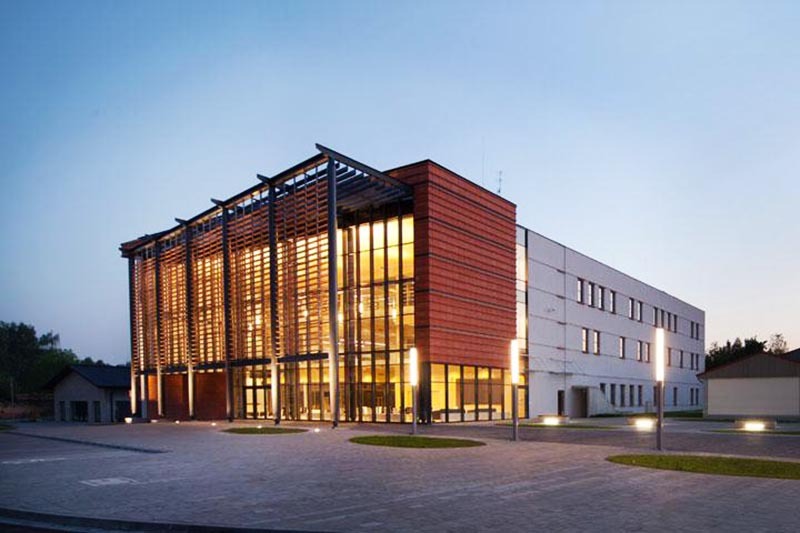 In 2011, the design by Andrzej Zatwarnicki received the SARP award for the best architectural development built with the support of public funds, and it also won the Polish Architecture XXL award. Five thousand square metres, featuring an underground parking garage, two small cinema auditoriums, a café, a children’s play area, conference halls, and almost one and a half thousand guests each day: this is not a description of a shopping mall, but of the Oświęcim library premises which is to imitate a shopping gallery. And it does: ‘bookshops’ are laid out on several levels, as in a shopping centre, there are two entrances – one on each side of the premises, as in a shopping centre, and the interior is bathed in glittering reflections of rainbow light formed by the horizontal layout of the outside ceramics which causes refraction. The façade looks like blinds. However, instead of the various goods and commodities you’d find in a shopping mall, the shelves are full of books. 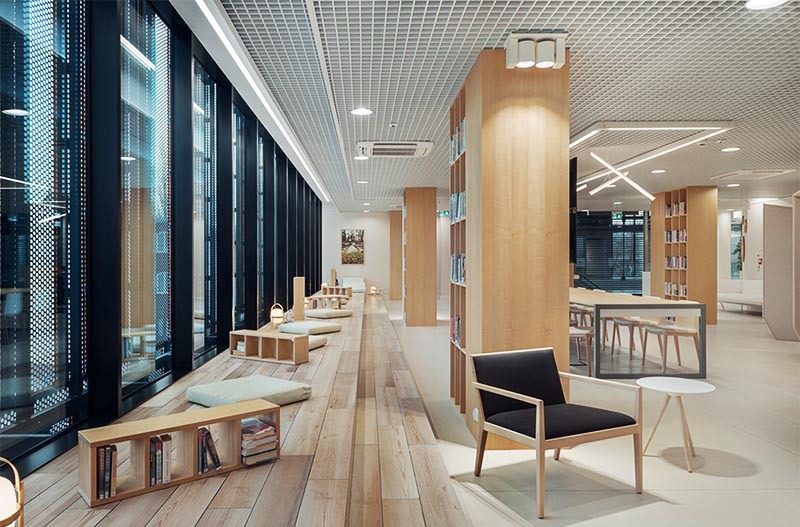 The contest for the design of a municipal library building, the aim of which would be to attract the average citizen to borrow a book, was won by S2 Susuł & Strama Architekci design studio. 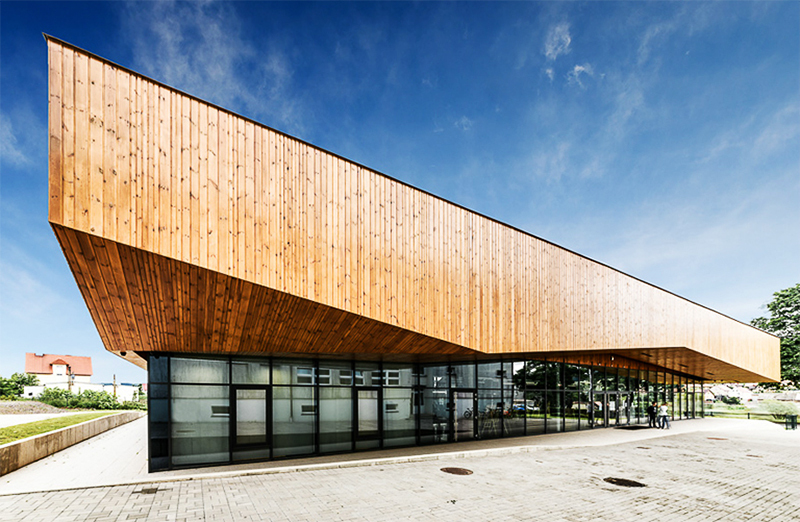 The goal was achieved by combining educational and leisure functions within one building. The Book Gallery was opened to readers in 2011 and was listed as one of the best European libraries in a list published by World Architecture News service. Do you enjoying reading a favourite book while sitting or lying on a beach, regardless of the weather? This is possible thanks to a multimedia library in Sopot, which is located at a shopping mall next to the railway station. The interior design was entrusted to Jan Sikor, and judging by the reception to his design for Stacja Kultura Culture Station) in Rumia, success was inevitable. The venue, which was opened at the end of 2015, is inspired by Sopot’s beaches and nature, which is reflected in the original wood decorations and white and natural green colours. Apart from offering discrete working or meeting spaces, Sopoteka encourages the use of the Strandkorb Zone – enclosed individual work stations – or the Beach Zone, where you can read while lying on a comfortable beach chair-imitating chaise longue. The library offers a wide range of art: books, visual arts and music, in traditional as well as digital format. It’s also a place where you can attend a meeting with the author of your favourite book, a workshop, or one of the events held on regular basis, such as Literary Sopot. Here, the cultural peak season lasts all year round. Small villages can also boast beautifully designed libraries. At Czarny Bór in Lower Silesia, a municipal cultural centre was opened in 2014. Its architects, from Wrocław design studio ISBA Grupa Projektowa, focused on functionality, elegance, and simplicity spiced up with a bit of extravagance. A glass plinth housing an exhibition space and a café is the support for a huge wooden loft. Under the loft’s roof is the library hall and a wide corridor. One wall of the building creates a sheltered courtyard for the neighbouring school and the line of the building harmonizes with the nearby hills. The reading room is quite ascetic in style featuring concrete floors, brick walls, and an uncovered reinforced concrete structure. The unadorned interior was laid out around two oval structures. The first is the librarian’s desk and a café, and the second houses a computer room surrounded with racks, and a reading room. As the building is a cultural centre, apart from the library there is a hall for performances and a place for artistic workshops. Thus, the library is not only meant for borrowing books. A lot of cultural events take place there, but first of all, it is a place where the local community can integrate and relax. Wrocław's 8 Namysłowska Street is the address of an ultramodern multimedia cultural centre. 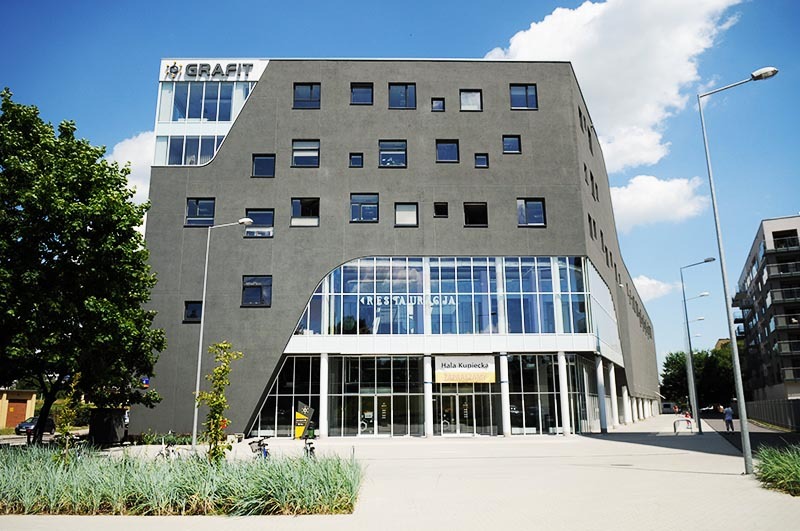 It’s been open since March 2015 in the place of once planned but never built business centre – Grafit [Graphite] Hall. It was established by merging 4 other public libraries. The place attracts with its bibliographic items (35 thousand books and magazines, 5 thousand films on DVD, 2 thousand music albums, audiobooks, computer games), various sorts of cultural entertainment, and a quite original interior. The floor features a red ribbon – the sign of Wrocław’s libraries – which divides the space into squares. Its colour contrasts with the dominating white. Apart from a library there is a meeting space, a playroom for children, and a leisure zone with a stand for speakers. The interior design was developed by the Synergia studio: Anna Bać, Krzysztof Cebrat, Piotr Michalski, and Sandra Piasek (as well as Małgorzata and Mateusz Sum, with whom they cooperated for the contest). The Grafit [Graphite] Library and the city of Wrocław are facing the challenge of organizing the International Librarian Congress in 2017, and the challenge must be met as the city’s title of UNESCO World Book Capital demands.